The Sunday Series II Finale sees a whooping total of 17 boats taking part, bringing the fortnightly racing series to an exciting close. This was despite the light air and strong currents, providing yet another challenging test of perseverance and tactics throughout the pennant 4 course. Series leaders Invictus led the fleet from start to finish – securing the IRC Title with another bullet. They make amends for their DSQ during Saturday’s Twilight Finale, displaying a dominant performance for the 5th race of the Sunday Series II. Yesterday’s results were also the exact reflection of the Overall IRC Series results, with Jong Dee and Shardana claiming 2nd and 3rd respectively. In the PY Class, Sangaree returns from a triumphant Western Circuit campaign to secure line honours ahead of the rest of the fleet, but only manages 4th after handicap correction. Southern Light kept close to the leaders to earn her a well-deserved bullet, finishing the Series on a high. 2nd place went to the Lucas Van Maarschalkerweerd’s Minx, staying just ahead of 3rd placed Olmeto. Southern Light’s win could only muster an overall 4th placing in the Series, 1 point behind Olmeto, whose 3 points yesterday contributed to their 3rd in the overall standings with 13 points. A bullet and consistent performances from Minx earned them a 2nd for the Series, this following their overall 3rd in the Twilight Series II. 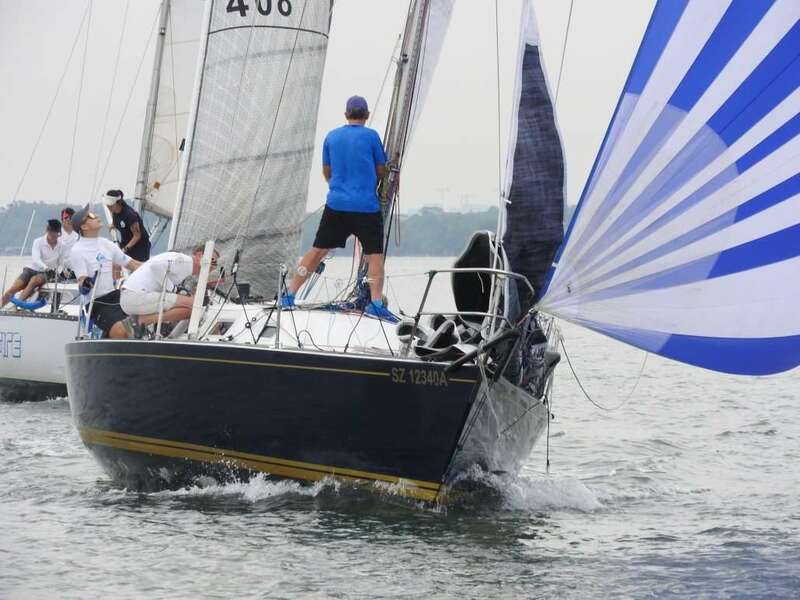 Despite finishing a dismal 5th in the fleet for the last race of the Series, New Blue Eyes did enough to secure a weekend Club Series double and the PY Title on 7 points. Shaun Norris’s Witblits had a similar outcome in the Cruising Multihull Class, recording their worst result for the series yesterday, but had already secured the Cruising Multihull Title with 4 bullets from Race 1 to 4. Kaze’s return to club racing reward them with a bullet, serving as clear indication that they’re back in contention for subsequent club series! Consistency is the key factor to Eepai’s well-deserved 2nd in the race and 2nd overall, notching top 3 finishes for all the races she participated in. Baloo’s strong attendance in the Series gave them the right to be on the podium in 3rd, completing the Series on 14 points – 5 points adrift of Eepai. Despite a no-show from the Beach Catamarans yesterday, we’d like to congratulate Uli Braun and his Nacra 15 for winning the Sunday Series II Title with 2 bullets. Doug Fimmell’s Madfish II sits pretty 2 points away on 2nd place and another Viper, Jeremy Nixon’s Bad Influence, took 3rd on 21 points. Congratulations all winners, thank you for another great Sunday Series turn-out! We will be taking a break from racing next week, Sunday Series III race 1 commences on 16th September, 2pm. See you there!